In the late 80's, we worked on the information technology strategic planning methodology. We distinguished between data, information, knowledge and wisdom, showing the logical relationship between them. Wikipedia has these graphical representations - often we did it as a pyramid with wisdom the peak - a pinnacle of thinking processes. If we achieved wisdom with technology, we would achieve the ultimate. The components are described here. The Wikipedia article continues with a section on criticisms: Rafael Capurro, a philosopher based in Germany, argues that ... any impression of a logical hierarchy between these concepts "is a fairytale". What do others say in this discussion? In my search, I found this very fun and quotable assertion. It was my "morning smile". "Owning a state-of-the-art CD player is pointless if you use it only to listen to polkas played by a kazoo ensemble." - T.H. Davenport and L.Prusak in "What do we talk about when we talk about knowledge?" Our picture today brings together the bizarre and the beautiful. The bizarre is that this is a fasciated lily in the Lilycrest hybridizing field this year. It is a mutation caused by growing conditions that cause a flattened stem which produces dozens of flowers crowded together in a 'bouquet'. 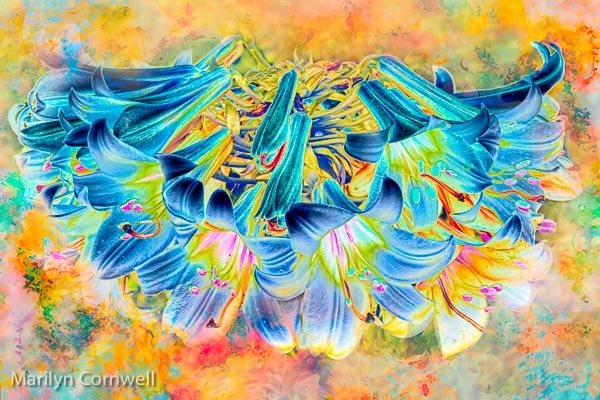 The beautiful is the blue lily - it's been given a blue wash in one of my photography filter programs. A blue lily isn't achievable with its normal dna. Likely a Delphinium will need to get spliced into it to get this colour range.